This is local to me, so I thought I would check it out. The cab is gutted, but the side art looks great. This is the second time he has listed it on ebay with no bids, so maybe I could get it for a little less than he is asking. With nothing but the coin door and cabinet itself, I feel that I could end up sinking a good deal of cash into making this whole again. I am not a big centipede fan myself, but I do enjoy working on machines. This is the second time he has listed it on ebay with no bids, so maybe I could get it for a little less than he is asking if no one picks it up. How available are parts for a centipede? If parts are hard to come by they might make this project more expensive than it is worth to me. You could always use a cheap older computer with MAME and run centipede on it that way... probably save some coin. I'd pay $50 bucks for that shell, if I was local. Looks to be in pretty good shape! I wouldn't say it's not worth the money if you really want to do it, but considering you need SO many parts, this will likely cost you a lot more than just buying a really nice Centipede. If it's a labor of love, then go for it. I have a fully working Centipede that needs cleaned and some water swelling fixed, and I doubt I could get $300 for the whole thing. Wood repair and new sideart and it'd be a nice game. But try to buy the parts individually and you'll probably spend a lot more than that. MAME it and yes, you could save some money, but you'd still need a lot of the above parts. A few ebay searches over the last two weeks looks as though marquee and cpo are cheap and available enough. I did see one complete cp with crappy art. No luck on a bezel or wiring. All in all parts seem available and resonably affordable. At present I am about 65% leaning towards getting the cab. PS - Thanks to whoever shortened the link. I did not know the trick, but I do know now and will use it in the future. Side art looks pretty good on that one which will save you about $180 if it was bad. Parts are available. Go forth and restore. Apart from the economics, there's also the feeling of saving another classic cab. Even though Centipede is far from rare, the game deserves it. Centipede PCB's should be pretty cheap, I think about 50 bucks. That is because many Centipede owners install a Millipede PCB with a Multi-pede kit. Mame-ing it would not be my choice. And also way more expensive. Quarterarcade has a CP, but I think (like everything there) it's pretty expensive since it needs a CPO. However there is a trackball in there, which will likely require a new bearing and roller set and new ball. There is a monitor in there (horizontal position) can't it be used ? ^^Do what he said!^^ If I were local, id have that in a heartbeat. Your lucky I live in illinois. I'm right in the same boat with Cabinet #1, which was free and a Centipede. I'm sloowly putting it back together, bit by bit. The only advantage I had on mine was a empty control panel, but with the handicap of black paint removal on the sides. I got my Atari TB from quarterarcade in dirty stuck condition, but it cleaned up well. Now just the rest of the parts. My approach is get function first, then the nice bits. The side art still has vestiges of the black paint I stripped off, but that'll be the last bit after the cpu, harness , crt, preecious blinky buttons and such. I'll put in regular switches, for instance, till the Atari LEDs find me. Keep a notion of patience and a budget, and the parts will show up. The more it goes together, the more tempting X part at Y price will be, but I'm not _yet_ at that stage. I'm only at vital part #4 of at least 10.. to get it working. Then the icing. 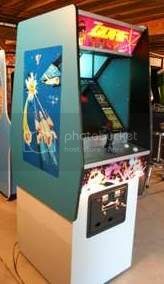 If you order a pizza, put 1 quarter in their Galaga and the pizza's done before you are, you might be a video game junkie.. if you offer to tweak the crt , definitely. Well, if you found several of the parts for a very good price already (and if it has a monitor... I thought it didn't have one) and you are leaning towards doing it, then go for it. It definitely feels good to bring back a classic, and Centipede is a big one! And quite a great looking game for any gameroom. If you get tired of it but it's complete and working, you can probably sell it pretty easily. Non-gamers have occasionally asked me if I had one to sell, for their family room / gameroom. The cab does not have a monitor, even though there is one in the pics. No wiring or power supply either. It is really just the cab and the coin door. For me it is the process of putting this thing back together that is the fun part. I am not looking to really make a big profit on selling this, but since this is not a favorite of mine I would not be opposed to selling this to fund a cab purchase or trade for something I do want. About MAMEing it.....I already don't like the boot up time of a 48in1, let alone that of a MAME PC. It's OK for a dedicated (general Jamma) mame cab, but not for a classic. And, emulation is emulation. It's never 100%. Good luck and let me know if you need help/advice. Page created in 0.271 seconds with 33 queries.